A technique that has gone down well with my Y12s this week has been ‘Speed-Dating Revision’. It has helped capture those multi-trajectory needs and had another subject teacher coming down to ask about it as the students declared for its benefits in their subsequent lessons. Unit summary sheet with content divided into topics and framed as key questions that cover the spec. Students facing each other in speed-dating pairs along a row of desks. Each pair is allocated a different unit topic to work on. They select a question by a throw of the dice (one dice if there are 1-6 Qs, 2 dice if there are 7-12 etc). The timer starts and they write down all they know on that topic in the 3 minutes allocated. At the end, they read each other’s cards and score their partner’s card a 3 if their answer is better than theirs, 2 if it’s roughly the same in content richness, and – the hard one for them – 1 if it’s not as good as theirs. One side of the desks is then asked to move 2 places down the row; the one remaining is asked to move on to the next category of topic questions with their new partner – and roll the dice to begin a new round. The group steadfastly maintained concentration for the full 30 mins we did this for in each lesson covering 6 rounds (we ‘upped’ the time-slot to 4 & 5 mins per round once they were warmed up’ and as they found they were coming across questions they had previously ‘done’ – that was fine; they were expected to use the ideas from the other person’s card to enhance their own answer second time round). On the occasions where we had an odd number of students, I read the isolate’s card and scored it, which gave a chance to have one-to-0ne discussions with different members of the group throughout the exercise. As for the pairs, once they had got over their awkwardness in scoring a partner with a ‘less good than mine 1’ they just dealt out honesty. The most rewarding comments were the ‘Oh yes! Of course…..’ as they read someone else’s answer and realised what they had forgotten or missed out. At the end I quality-checked the answers that were being awarded 3s and pointed out additional points or perspectives that could have been included, or simply praised for the wealth/originality of points included. With my two Y11 groups I’ve used a modification of this theme. The size of the groups meant the speed-dating set-up was inappropriate, so I put a possible exam question on the top of 15 different sheets of A4 – and gave them out to each table. Pairs had 4 minutes to put as many points onto the sheet in answer to the question (bullet points/diagrams/lists..) before passing it on to the next desk at the end of the time. Each pair was given a distinctive colour pen/pencil/felt-tip to write with so their points could be traced across the full range of sheets they faced and this provided the accountability pressure. 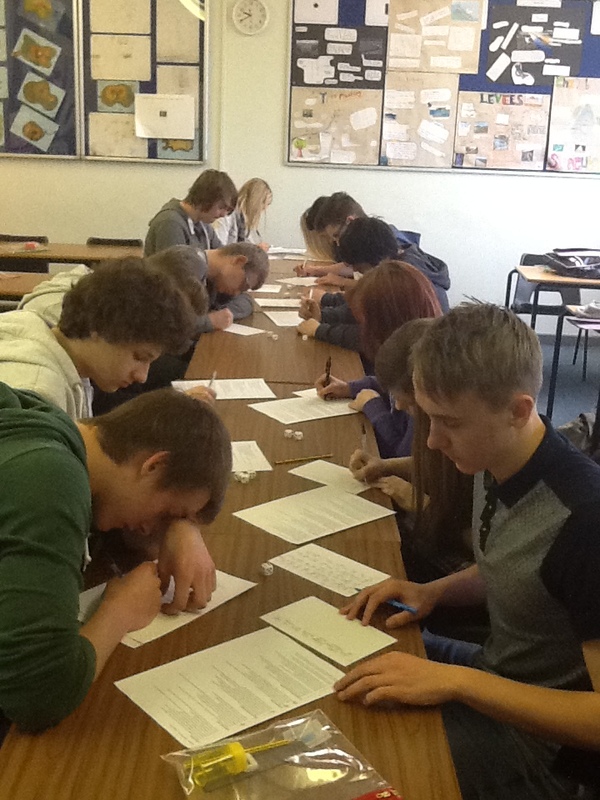 As content built up on the sheets as they snaked around the room attracting accumulations of residual information students were told they would lose points if they repeated points already written – making them read everyone else’s contribution before they tried to add their own additional points. At the end we had 15 questions with a full range of detailed content from the remembered revision of all within the group. I photocopied these and students came down at the end of the day to take away to make use of the collected wisdom of the group. Simple techniques to set up – but informing me of who is engaged in the revision, who needs a ‘quiet word’, a chance for the students to get a sense of how much others in the group are revising (always more powerful than me telling them how much I think they should be doing) – and an opportunity to in-fill some of the gaps in their own revision.